The new cover of Kino Lorber’s Blu-ray release of THE ICEMAN COMETH. 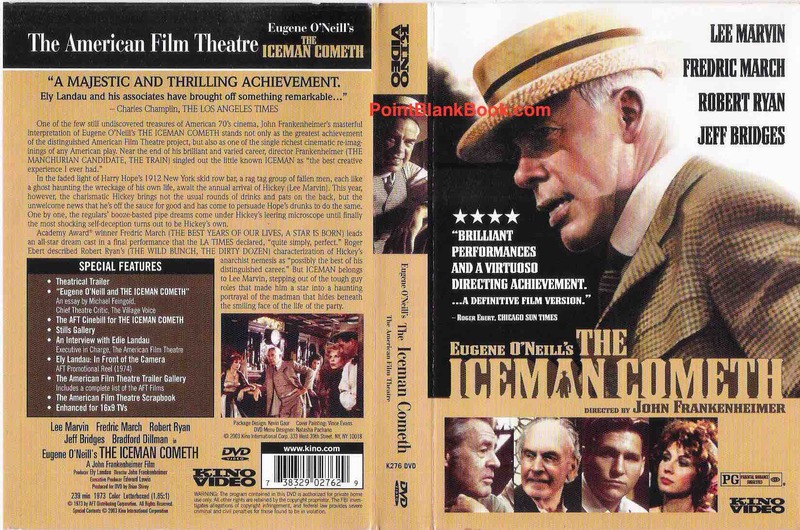 Full cover insert to Kino Lorber’s original DVD release of THE ICEMAN COMETH back in 2003. 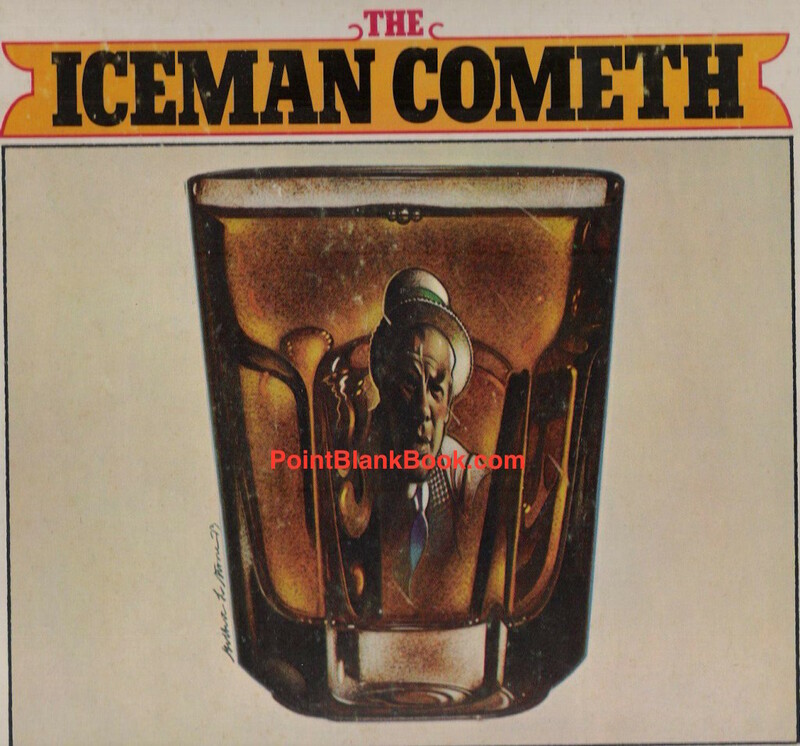 Kino Lorber, the DVD releasing company, has chosen to release The Iceman Cometh on Blu-Ray as of late last month. The same company had released it on DVD back in 2003 but they must have figured the time was right to update it to the newer technology. As far as any extras go, the Blu-Ray version has the same goodies that the good folks at Kino Lorber had added to the 2003 version. To put it another way, if you want to know some fascinating, never-befoe-published stories about the making of this criminally underrated classic, then don’t think you’ll find it on the Blu-ray. 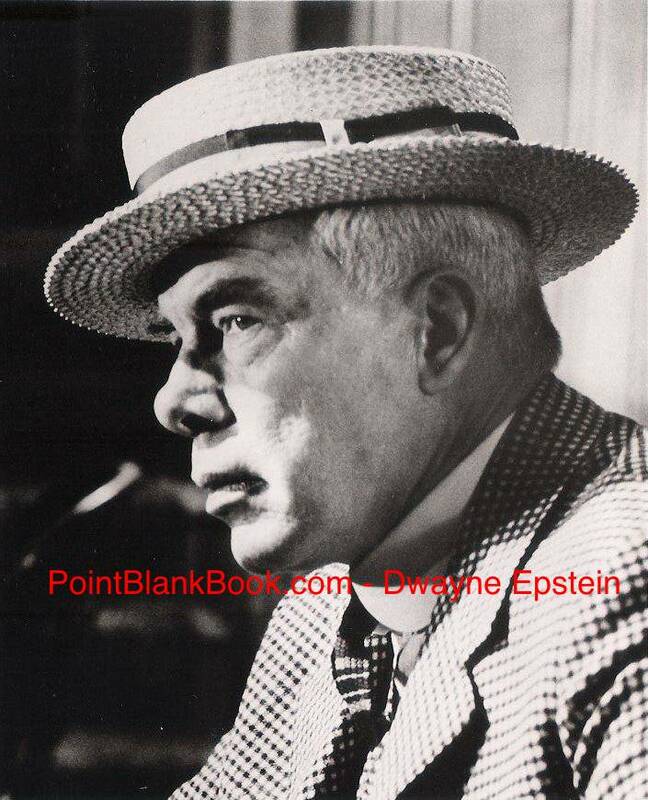 The best place to find such gold nuggets is between the pages of …that’s right, Lee Marvin Point Blank. What nuggets, you ask? Well, through due diligence (and timing), I was fortunate enough to get interviews with the likes of director John Frankenheimer, co-star Jeff Bridges, and several of the children of Robert Ryan. All of whom told me wonderful and unheard of tales concerning the making of the film. What kind of stories? Well, you can find out who the other superstar actors who were offered the Lee Marvin role of Hickey that Frankenheimer hoped would say no. You can discover the valuable inside lesson Jeff Bridges learned fro Marvin that they DON’T teach in acting school. Then there’s the very strange and off-putting thing Marvin did the day he met film legend Fredric March, that is according to Cheyney Ryan, Robert Ryan’s son who was there to witness it. Don’t take my word for it, of course. 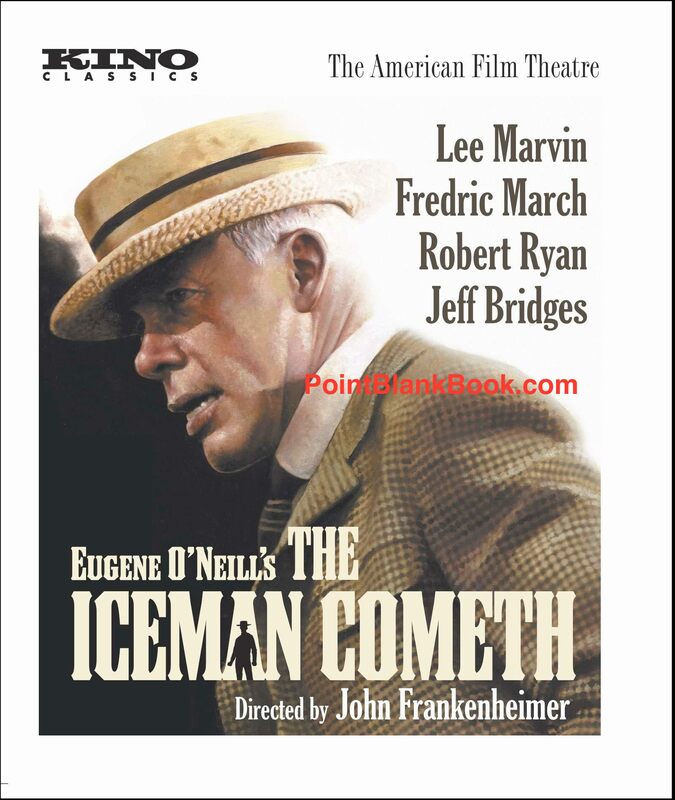 See the brilliance of Marvin’s performance and the rest of the cast on Kino Lorber’s recent Blu-Ray release and then, for the full story on The Iceman Cometh’s making, read Lee Marvin Point Blank. You won’t be disappointed. 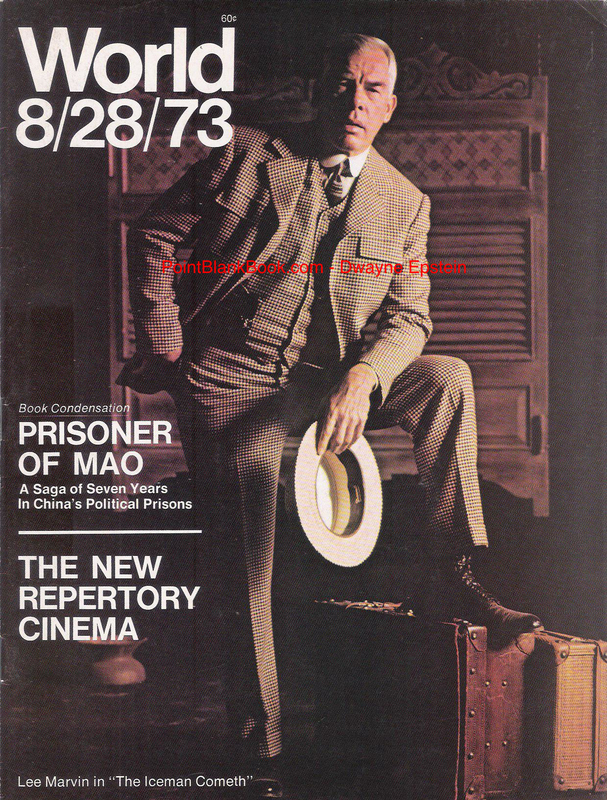 On the cover of the now defunct WORLD Magazine, Lee Marvin does his part to promote THE ICEMAN COMETH. Hard-to-find four record set of the film’s soundtrack. Cool cover, huh? 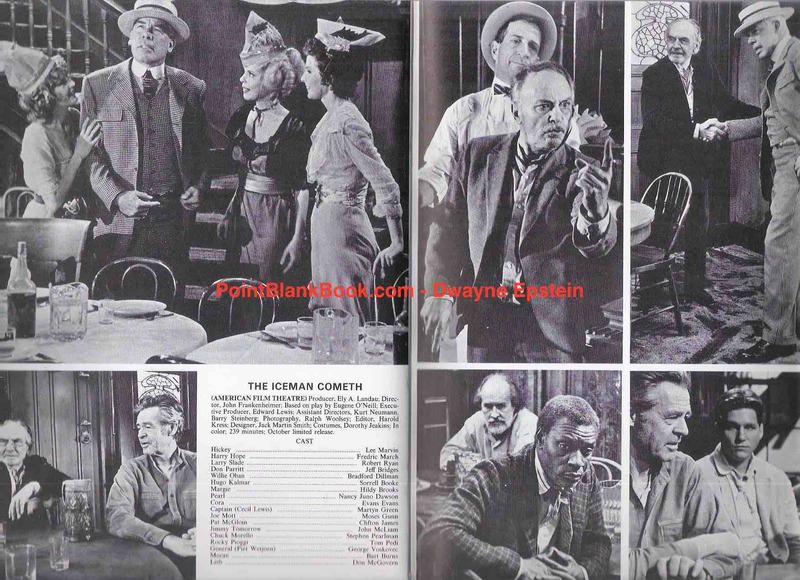 2-Page spread in 1973’s edition of SCREEN WORLD. Several folks have told me that the stories of some of my encounters in researching Lee Marvin: Point Blank are worthy of a book itself. Well, with that in mind, I’ve decided to recount some of those adventures periodically via this blog. First up, the late, great film and TV director, John Frankenheimer. L.A. Times film critic Charles Champlin graciously put me in contact with Frankenheimer of whom whose films I have been a fan of, such as The Manchurian Candidate, Seven Days in May, Bird Man of Alcatraz and especially the underrated Seconds. Getting the interview itself was somewhat rocky as schedule conflicts, traffic, and unfortunate events kept cropping up on both ends. Yet, I persevered. In doing so I learned a basic rule of thumb that a researcher can really do nothing about but grit one’s teeth and sally forth. Works like this: If the subject is amenable and easy to get along with, then whoever you must come in contact with in their sphere is almost always the opposite, i.e. managers/agents/assistant/Gal Fridays, etc. Since Frankenheimer was ultimately a wonderful interview, you can guess what his assistant was like. She’ll remain nameless out of respect, but geez, did she put me through the wringer! 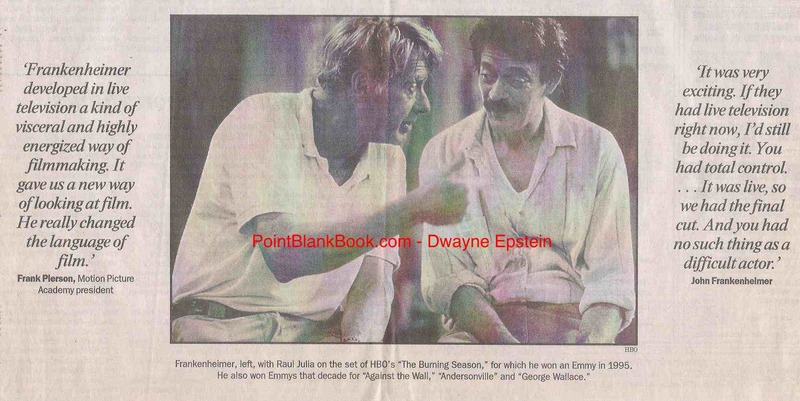 As for Frankenheimer, he could not have been more forthcoming with wonderful heretofore unknown tales of working with Marvin in both early live television and in the mammoth undertaking of filming Eugene O’Neill’s The Iceman Cometh with Marvin in the starring role as Hickey. I had no idea that both Gene Hackman and Marlon Brando were up for the role which Frankenheimer savored with delight in recounting how glad he was that Marvin played it. There were other revelations, of course, but you have to read the book to discover those. 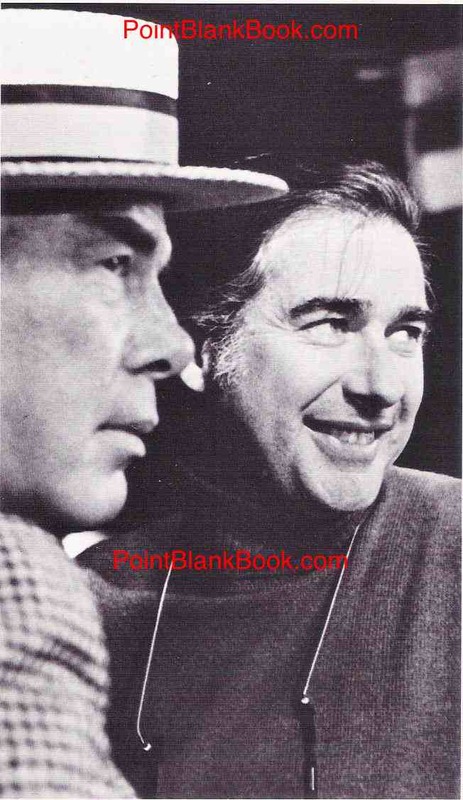 Director John Frankenheimer (left) with Lee Marvin on the set of The Iceman Cometh (1973). Here’s the interesting part. The interview was conducted in his temporary offices for the editing and promotion of his then latest project, the cable movie he directed about Andersonville. As such, the quarters were rather cramped with narrow hallways throughout to connect the trailer-like buildings. As for Frankenheimer himself, he had a striking a presence, with a resonant voice, tinged with a slight New England accent and a broad-shouldered build well over six feet, more than enough to intimidate my scrawny little 5 foot 6 frame. I was not surprised to find out later that he had originally wanted to be an actor. He could have been quite successful with his massive frame and impressive bearing. All this is stated to set the scene. The interview over, we shook hands. said our goodbyes and I make a quick trip to the restroom before going out to my car for the long trek home on the 405. As I turned the corner on the way out, Frankenheimer was turning the narrow corner towards me. With no one else around at the time, he seized the moment to put the final punctuation on our conversation. As he looked when I met with him, from the L.A. Times obituary of John Frankenheimer. His massive hand jutted out just slight below my throat to slam me against the wall. Pinned like a butterfly, allI I could do was stare at him. Doing that very theatrical thing that tough guys like to do in movies, he looked away from me, sniffed the air slightly and said, “You’re not going to take any cheap shots in your book,” then looked directly at me to add, “Are you?” In my head I was saying,”That’s none of your business, buddy!” What came out of my mouth was, “Of course not, Mr. Frankenheimer, sir.” He held me there a few seconds more, staring me down, and then, finally released me. I slid down the wall slightly, checked my neck to make sure it was still there and then sheepishly left to my car. I tried like hell to look as masculine as possible, but I think I looked as masculine as Don Knotts. As I drove home I kept thinking to myself, “Are all the interviews gonna go like this and is it worth it?” The answer would take me months and even years to discover. 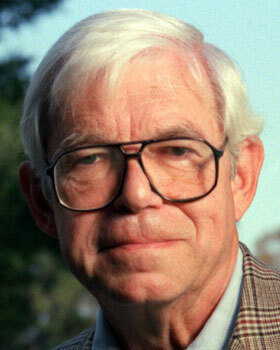 L.A. Times film critic and arts editor Charles Champlin died last Sunday at the age of 88 from complications involving Alzeheimer’s Disease. Being a lifelong movie fan, as a rule, I’ve never been a particular fan of most film critics, but Champlin was an exception. I found the more well-known critics to be pompous, pretentious and more often than not, just plain wrong about the films they reviewed. For the most part, that exception was Champlin. He wrote of films from a place of appreciation, and was generally less stuffy and esoteric than many of his contemporaries. To me, that translates to a simple yet all encompassing difference: He genuinely liked movies. 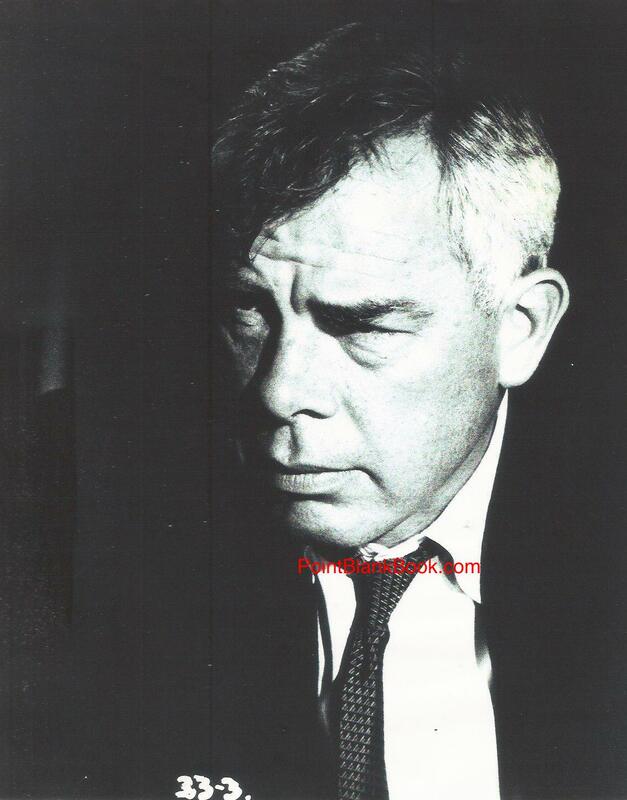 When I was in the earliest stages of researching Lee Marvin: Point Blank back in 1994, I traveled with fellow biographer Marshall Terrill (Steve McQueen: Portrait of an American Rebel) to Lone Pine, California, for the annual film festival held there. It was a rather small town affair for anything deemed a film festival, yet there were a surprising number of interesting guests and speakers. Marshall told me to be prepared to catch a good interview on the fly so with tape recorder at the ready, I did just that. 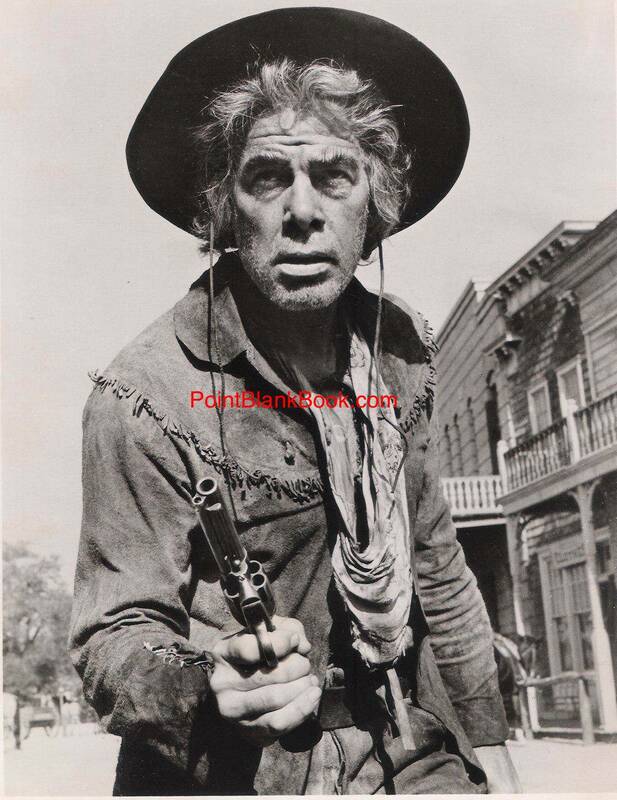 Since Lee Marvin had filmed the likes of Stranger Wore a Gun and Bad Day Black Rock in Lone Pine, I was fortunate enough to speak with such co-stars as John Ericson, John Mitchum, Anne Francis, and several others. At one point, I found myself simply having chat with Charles Champlin. When I told him I was working on a book on Lee Marvin, he began giving me his thoughts on Marvin, at which time I asked if hed be willing to go on record. He simply nodded as I fumbled with the tape recorder. Below is the transcription of that all too brief conversation which was already at full steam by the time I hit ‘RECORD.’ Enjoy…..
Charles Champlin as he looked at the time I interviewed him at Lone Pine, Oct. 8, 1994. Champlin:…I could put you in touch with Frankenheimer. Epstein: I would love that! C: Because you know they did Iceman Cometh and Iceman Cometh is one of the best things Lee Marvin ever did. But I think they worked together two or three other times, at least in live television. D: Right. I was just going to say that I think they did some TV together. C: Yeah. And John was a terrific admirer of Lee Marvin’s. D: I know he took a lot of flack in the beginning for casting Marvin and not Jason Robards, which everybody anticipated him doing. He said in an interview at the time that he didn’t want somebody who knew the part inside and out and wouldn’t add anything new to it. C: That’s exactly right. It made sense. Marvin was an interesting man. In some ways a tragic figure. You always had the feeling about Lee Marvin that there was more work that should have been done. D: That’s a great quote. I remember reading that. C: Of course, it wasn’t true. Ryan brought great dignity to everything he did. He was one of those actors that couldn’t do anything wrong. C: I told John Ericson here that the first laser disc I bought was Bad Day At Black Rock because I thought Ryan was just wonderful. His villains were heroic, too. It’s nice to go both ways. He dared to go both ways. D: I thought he was most….he was like evil personified. C: Absolutely right. Like I said, Marvin was a terrific actor, too. D: What quick thought come to mind when you think of Lee Marvin? C: I have one of those memories of Lee Marvin explaining in Stanley Kramer’s Ship Of Fools how he never made it in baseball because he couldn’t hit a curve. Marvin as Bill Tenney in Ship Of Fools (1964) explaining to Michael Dunn why his baseball career went south. D: Curve ball low and inside, to Michael Dunn. Great scene. C: That’s my memory. I never did an interview with him, to my knowledge, that I can remember. Cat Ballou of course was just a classic piece of film acting and film making, really. It was a wonderful idea. It’s Elliot Silverstein’s best film by far. There’s no question about that. Marvin as Kid Shelleen, his Oscar-winning role in Cat Ballou (1965). Marvin had a great versatility. Probably, he tended to get typecast, I suppose in those action roles because he did have a kind of lean and hungry look about him. But he was a good actor. I just think that all actors are the victims of what they can do. I think there’s so many. Maybe Ryan, too, is a causality of a system that puts you in a certain niche. Then it’s hard for you to get a decent role. D: Maybe more so than Marvin because Ryan never seemed to have the kind of choices in roles that Lee Marvin did. C: Yeah, well that’s true. Thank you very much. Once I turned off the tape recorder, Champlin was as good as his word and did indeed put me in touch with Frankenheimer. Naturally, I wished I had spoken with Champlin at greater length but still feel very fortunate to have the time with him that I did. Yet again, another example on my part of not appreciating my luck at the time. He will be truly missed.